The 3+ foot high and wide transmit/receive Coaxial Alpha Loop Antenna is perfect to sit inside on a desk beside you when it is cold out; or Condo, SOTA, Beach, RADAR, or any place you need a High-Q directional HF antenna with low noise capabilities designed into the system. The LMR-400 based element of the Alpha Loop offers you a light antenna in a small package, which deploys in 60 seconds! 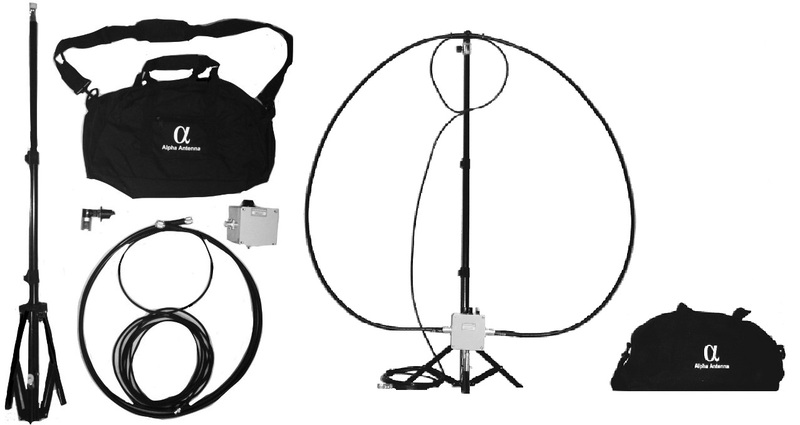 The Coaxial Alpha Loop Antenna is uniquely mountable on the included tripod, providing you with the greatest ease of deployment, use, and effective efficiency ever made available. 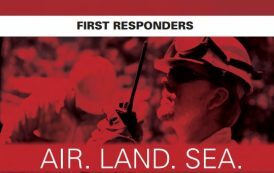 Place it on your table beside a rig for base ops, in the passenger seat of your vehicle for the best mobile antenna ever, or use it in the field as a high impact tactical antenna solution. This antenna also come with the built-in SWR Indicator, so no Antenna Analyzer is needed! Silver plated SO-239s are milled and formed 100% in the U.S.A.
All other parts are made and assembled the U.S.A. Assembles and dissembles from the included field bag in 60 seconds. As this antenna is a loop, there are no taps on coils and no counterpoise wires needed. Has a built in tuner that allows you to easily match the antenna for transmit and receive from 7 to 29.7 MHz (40 Meters through 10 Meters). High noise rejection is also one of the favorite features of this antenna for many operators in RFI prone environments. Includes a coax feed line with BNC Connector plus BNC to PL-259 adapter. The Coaxial Alpha Loop Antenna appears as a large resonant circuit to your transceiver. The loop is a large single turn inductor of the circuit. Due to the large size of the inductor, radiation of your signal very easily takes place. To increase overall ERP, the variable air capacitor is placed inside the loop. Doing this captures the power from the variable air capacitor inside the loop, where the power that would normally be lost to ground can be recycled. Other designs place the capacitor below the loop where losses would be radiated on the outside of the loop toward the ground. Better coupling is the result of the Coaxial Alpha Loop Antenna using a shielded coupling loop. Where return-loss (VNA parameter S11) increases rapidly when the distance is increased from 0 to 2-3 cm (1″), then becomes flat with further increase in distance. Over the initial distance increase, the shielded coupling loops had about 6 dB less return-loss, i.e., better coupling. Additionally, shielded coupling loops had slightly better SWR than the unshielded coupling loops.